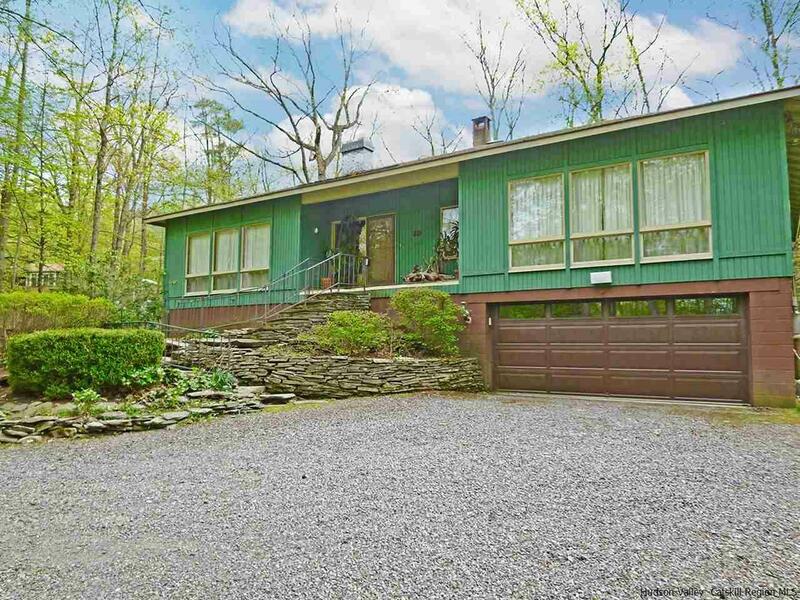 Tucked behind the Village on a quiet street and just a short distance from the Millstream you will find this Woodstock Jewel. One level living close to town with great mid-century bones, high ceilings and windows everywhere. Large open living spaces and very generously sized bedrooms are accented with warm wood details that so elegantly frame the peaceful views of nature from all sides. Terrific closets throughout plus a huge basement at ground level with separate entrance and rough plumbed for an additional bath if one desires more finished living space. This home is graced with an easy and open flow and has nice separation between the bedrooms and common living areas. The kitchen is well equipped and designed for entertaining, including a custom built serving/storage unit which opens on the dining room/family room side. A deck on two sides provides for al fresco dining and outdoor living space. There is also a truly special formal living room with a stone fireplace and gorgeous windows. Well maintained and loved by the seller for the past 40 years, a very comfortable home for full time or weekend use in an ideal location.